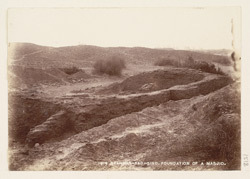 Photograph of the foundations of a masjid from the back at Brahmanabad in the Hyderabad District of Sind in Pakistan, taken by Henry Cousens in 1896-7. This is a general view of an excavated site. Cousens wrote in Brahmanabad-Mansura in Sind Archaeological Survey of India, Annual Report 1903-04, "Along one street, alone, I cleared the foundations of three mosques...with their buttressed mihrabs all placed in the usual position, that is directly towards Mecca. this position they seem to have got exactly, the direction being a trifle south of due west. There is no mistaking the foundation of a mosque when found. As a rule, it is constructed with three walls, forming three sides of a rectangle, the fourth side, or entrance, being open. Outside of the back wall are one or more projecting buttresses, which represent the niches or mihrabs within, one always being in the centre of the wall. These mosques, being very small, have each but one niche and one corresponding buttress at the back, which is present in these foundations. In one mosque four pillars supported the roof, while in another two sufficed for the smaller building. The pillars were of brick, about three feet square, the bases of which still remained. The three sides of the building had heavy brick walls, while in front of the largest building was a small courtyard with an outer gateway."